We have been repairing, tuning, and providing new homes for used harmoniums and tambouras in Tucson, Arizona, since 1984. We teach harmonium and tamboura classes, individually and for groups, and we produce classical Indian music concerts and kirtan events in Tucson, Arizona. 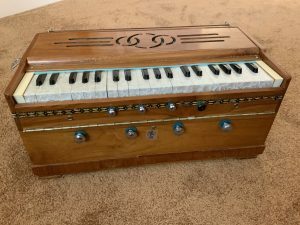 If you have a harmonium or tamboura you would like to sell, are interested in purchasing a used one, are interested in classes, or want more information, contact me.